Amblyopia is a condition also known as lazy eye. It is caused by a problem where the brain inhibits vision in one eye and is a neurological ailment. It is not correctable with glasses or contact lenses, and usually affects only one eye. It causes reduced vision and can be caused by strabismus, or constant turning of the eye. 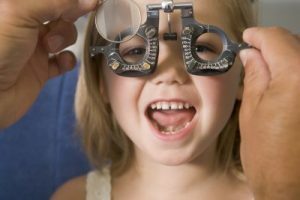 Amblyopia can be treated at our pediatric eye care Hershey office by using eyeglasses, eye drops, vision therapy or eye patches to help strengthen the weakened eye. Amblyopia should be corrected before age two for best results. If the patient is older, vision therapy must be employed to help fix it. Our pediatric eye care Hershey office also treats children for nearsightedness and farsightedness. These conditions are treated with eyeglasses or contact lenses. If your child has strabismus, or crossed eyes, which is different from a lazy eye, they will need a different type of therapy. With strabismus, the eyes deviate when looking at objects. It is classified by constant strabismus, wherein the eye turns all the time, or intermittent strabismus, where the eye turns only some of the time. We carry a wide range of eyeglasses, frames and contact lenses for your child at our pediatric eye care Hershey office. Our selection is designed to fit all of our patient’s needs and for all budgets. We especially cater to children and their needs when it comes to vision, handling eye problems such as strabismus, amblyopia and nearsightedness. For more information, call our offices and come in for an exam. If you have noticed your child has a lazy eye or crossed eyes, come in as soon as possible so that we can begin treatment before the child gets any older. If left untreated, the amblyopia can result in poor and decreased vision, ranging from mild to severe.